Apple reported weaker than expected iPhone sales growth last quarter, prompting concerns that the iPhone “supercycle” may be over. The Silicon Valley company can spark iPhone sales growth by making the phones cheaper, an RBC Capital Markets analyst says. You can view Apple’s stock price in real time here. Apple‘s iPhone is not done yet. Despite sluggish iPhone X sales sparking fears that this might be a bellwether for weaker iPhone demand, the company may have one way to save its seminal smart phone – make it cheaper. The company has slowly begun releasing details of its next generation of iPhones with plans to release an updated version of its iPhone X, a larger version, and a budget-friendly model with an LCD screen (instead of an OLED screen like its higher-end counterpart). Apple’s iPhone sales slumped in the first-quarter of 2018, falling 0.9% year-over-year to 77.3 million units, missing the Wall Street consensus of 80.2 million units. 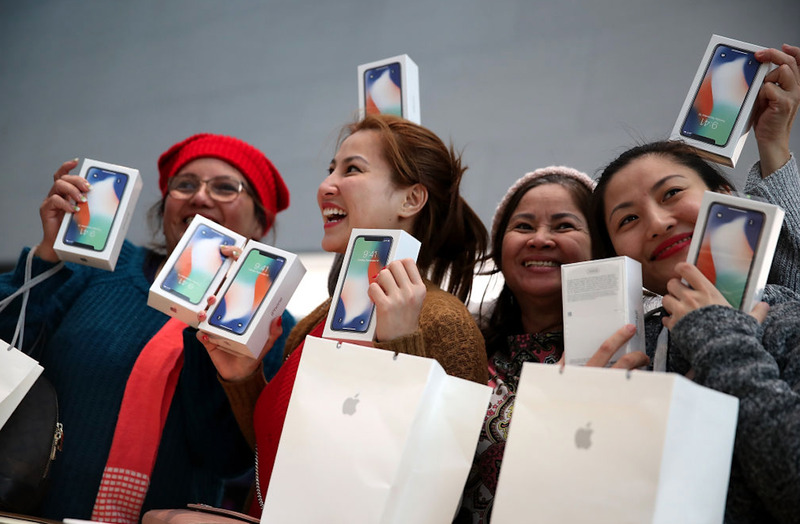 While the shortfall in iPhone sales was compensated by the significantly higher average iPhone price– $US796, more $US100 above the average iPhone price last holiday season – some analysts believe the high price is scaring away consumers. The next generation of iPhones can be priced at $US700+, $US899 and $US999, Daryanani said. “This would effectively lower the average ASP’s but we think will drive a stronger unit growth,” he added. Still, Daryanani believes Apple’s focus will shift to its services segment, which has grown a lot faster than the pace of iPhone sales. He maintained his price target of $US205 per share, and a “Outperform” rating. 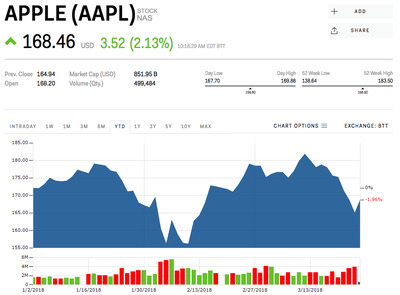 Apple’s stock was up 2.13%, but down 1.96% for the year. Read more about how Apple has taken a big stance that has largely insulated it from the privacy concerns surrounding Google and Facebook.